Alright, I'm Matt Jamie with Bourbon Barrel Foods here in Louisville, Kentucky. We've got the Kentucky Derby right around the corner and the official cocktail for that is the Mint Julep. We're going to make a real fancy one for you here today. We're going to start with some Woodford Reserve - about 3oz. right into your Mint Julep cup. We're going to go an ounce with our Woodford Reserve Mint Julep syrup. This is a really rich syrup. We do it with demerara sugar. We got some fresh mint here. You don't want to muddle this too much. You just want to bruise it. So what I'm going to do is roll it with my hands, open up, bend them, and get the oils out there. And then there's our ice which is our most important part besides the bourbon. You can do this with a blender. Mint sprig. And then what makes this really special is our gold luster. You can get this at a candy shop or any cake decorating store. Right on top. Straw. There's your real fancy Mint Julep. 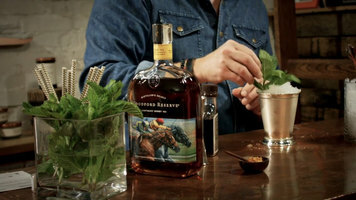 Woodford Reserve shows step-by-step how to make an expertly crafted Mint Julep with Woodford Reserve Bourbon. There's an emphasis on quality ingredients such as Woodford Reserve Mint Julep syrup with demarara sugar and hand rolled mint sprigs. This cocktail is perfect to enjoy while watching the Kentucky Derby. 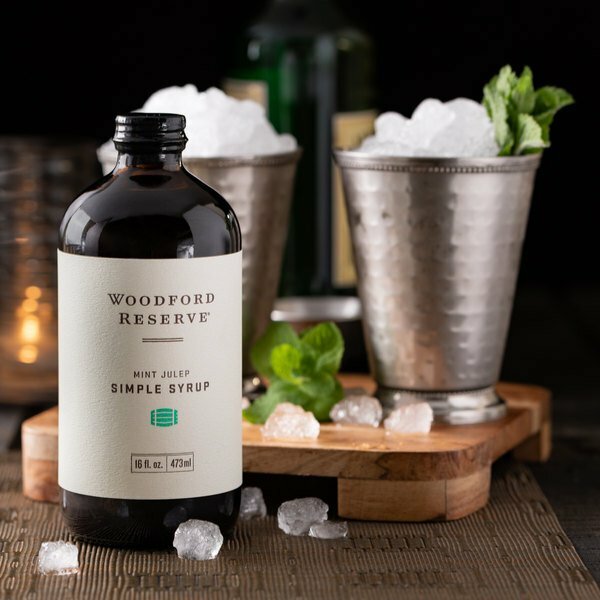 Whether celebrating the Kentucky Derby in traditional fashion or simply crafting a southern-inspired cocktail, bring revolutionary flavor to your drinks with this Woodford Reserve mint julep simple syrup. Made from raw demerara sugar and fresh spearmint to provide a rich, minty flavor, this simple syrup was born to take your high-quality drink to new aromatic heights and accentuate its authentic taste. Use to craft a proper mint julep, along with muddled mint, crushed ice, and your patron's favorite bourbon, or spice the classic cocktail up with the addition of jalapenos, fruit, or even basil. You can even use this simple syrup to create full-bodied mojitos, or add new depth to your iced teas, and fresh-squeezed lemonades! This rich simple syrup consists of a 2 parts demerara sugar to 1 part water ratio; the demerara sugar's presence lends warm, caramel notes for a more refined sweetness when compared to traditional simple syrup. Plus, this simple syrup's mint-infusion packs a fresh, crisp taste that brings your beverages to that next desired level. Packaged in a 16 oz. glass bottle that proudly displays the Woodford Reserve logo, this simple syrup provides attractive shelf presence in your bar, lounge, or tavern, so your customers will instantly know they are being served a high quality drink. This is my first time trying and making a mint julep so I have nothing to compare it to. But it was really good and I did enjoy it. This is amazing! It saves me from having to pre-make my own simple syrup. I’m actually going to be using this for baking, to make mint juices flavored treats for the derby party this year. Super excited to see how well the flavor translates over in baked goods. I’ll be sure to come back and post a picture when I do.